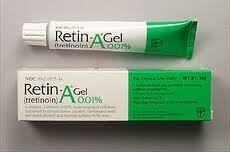 So I am thinking that if you are a woman and live in America you have probably heard of Retin-A. My mom used it when I was growing up and I used it for a few years in my 30's. But for the few of you that may not have heard of about this product and what it does, this sentence explains it. Retin-A is a twisted form of the vitamin A molecule, and works at the cellular level to improve your skin's health and appearance. But what they don't tell you about in all of the advertisements are the chemicals that are in this product along with the vitamin A molecule. Here are a few, and a little description. Hydroxypropyl cellulose-This is a food additive added to dairy based foods, fat based deserts, cereal, processed meats, precooked pastas and tons of other foods. It's used as a building agent, glazing agent, foaming agent, thickener and stabilizer. Butyland Hydroxytoluene-This chemical is added to most foods to preserve fats. It is made from the chemicals p-cresol and isobutylene. P-cresol is a chemical that is a mosquito attractant while isobutylene is a flammable substance one hydrocarbon away from common butane. BHT is prepared by the reaction of p-cresol and isobutylene catalysed by sulfuric acid. It's primary use is to prevent foods from becoming rancid. Brucine Sulfate-A poisonous white crystalline alkaloid derived from seeds of vomica and closely related plants. Used to denature alcohol. Can be fatal if ingested. Well, I will stop there, even though there are more. I think you get the point that there are some very harsh toxic chemicals in this "fountain of youth" cream, But don't get discouraged if you are a committed user of Retin-A. There is a natural alternative. Radiant-A. Radiant-A's base is made from Rosehip oil, which is a source of topical retinoic acid (vitamin A) in a natural bio-identical form. In 1983 the faculty of Pharmacology and Chemistry at the University of Concepcion in Chile conducted a 2 year study with an emphasis and study on the healing action of the oil. The study was conducted on 180 patients with extensive facial scarring, acne scarring, deep wrinkles, sun damage, radiation damage, burns, surgical scars and a group suffering from pre-mature aging. The results were outstanding and remarkable. It was found that Rosehip oil with continual application, effectively helped with reducing the effect of scars and wrinkles, along with preventing advancement of premature aging and helped in regaining lost skin color and tone. Later pharmaceutical companies caught on to the remarkable properties of this Trans-Retinoic acid, a derivative of Vitamin A and formed Retin-A. But as I said at the beginning, the prescription Retin-A has so many chemicals that it has been considered Toxic for human use in many arenas. Think about it, wouldn't you rather apply an all organic natural product to your skin that will help give you the same results without all of the harsh chemicals and side effects? These chemicals not only sit on your skin, but are absorbed into the skin and bloodstream. So here is a solution. Radiant-A is proprietary blend of Organic virgin oils. It not only contains Rosehip oil to stimulate new cell growth and preserve the skin's elasticity, but it also has other high end oils that help to replace the moisture, hydrate and replenish your skin. These oils also aid Rosehip in helping diminish fine lines and wrinkles. These oils help with healing many types of scarring too. When you combine Radiant-A with the other Real Raw Beauty products, it is the perfect recipe for beautiful, silky smooth radiant skin! You will see an immediate difference!